Poor little Wagstaff is slightly lactose-intolerant and worries about his cholesterol. Hell, I worry about EVERYTHING. If it’s not my cholesterol ticking back up despite my red wine guzzling, it’s zombie Nazis kicking in my doors at 3AM when I have to get up for work early. (They’re lactose-intolerant too). One of the things I gave up when knocking my LDL down was mac & cheese as a side dish with dinner every now and then. I love the stuff, I must admit, even if it’s from a box mix using flourescent orange “cheese food” that’s most likely radioactive and left over from the Korean War. It didn’t matter to me, it just tasted damn good. So, how do duplicate that flavor without all that milk, butter & cheese in the sauce, which may as well be cement poured into my arteries after a while? I searched around on the internet, figuring that the collective experience and wisdom of various vegans out there was to be found someplace, and I came across a very elaborate a complex recipe using ingredients like soy, miso, tahini, tomato paste, lemon juice & brewer’s yeast for the sauce. While this was an interesting dish, I found the aroma of the sauce closer to a box of Kraft than the taste, and the sauce was a little too liquidy and thin for my palate. But I’m giving you the link, since you might like it more than me. Since I’m lazy, I tried concocting something simpler. And what I came up with, while not as tangy as that box of war surplus dehydrated cheez wiz, is pretty good and packs a nutritional wallop. All my measurements here are for a single portion, perfect for the crazed shotgun wielding loner. If you have friends or family to feed, have fun with the math. 1. Melt 1 1/2 tbs. of margarine in a pan. 6. Give it a stir or two to prevent sticking, cover & simmer on low for 8-9 minutes. 7. Stir in 1/4 cup (or more if you like) of shredded soy cheddar cheese – 2 slices if you buy it in those American-Cheese-Slices type packs. Just tear ’em up into little pieces to help them melt when you stir them in. 9. Put into a covered bowl and let sit for 5 minutes, then chow down. It’s a mild cheese flavor, so probably experimenting with different types of soy cheese might be interesting here. The brewer’s yeast added a little bit of tang to it, along with a big dose of B vitamins, which makes this the perfect dish for someone coming down off acid, I suppose. Crunching the numbers, this portion runs @700 calories, with a whopping 30 grams of protein, no cholesterol, 19g of vegetable fat, 75% of the calcium you need for the day, and 100% of a bunch of B-vitamins. Not too shabby, and it has the taste and consistency of a mild mac & cheese cheddar dish…. 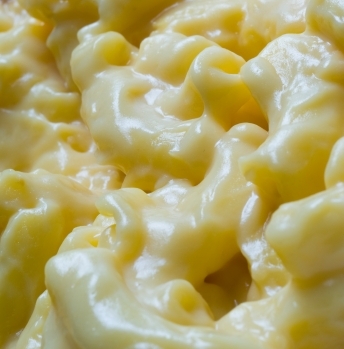 think the gooey middle of the baked mac & cheese. I know, I know…. nothing is EVER as good as actual cheese. But this is better than absolutely nothing. And it’ll even go well with red wine. What’s the brewers yeast for? Not sure, Gwen… since it’s not my recipe, I can only guess that the Brewer’s Yeast adds a subtle “nuttiness” to it, as well as a little sharp aftertaste that imitates the effect of a real cheddar. It adds a ton of B vitamins, that’s for sure!